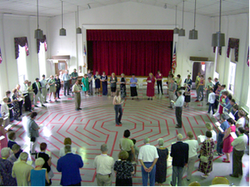 The labyrinth is one of the oldest contemplative tools and has been in use since medieval times. Still relevant today, walking the labyrinth is an opportunity for relaxation, meditation, healing, personal insight, creative exploration, and spiritual growth. Labyrinths—unlike mazes with which they are sometimes confused—have one single path to a center and back out, no tricks or dead ends or false starts. There is no single right or wrong way to walk a labyrinth. The labyrinth walker is free to simply set one foot in front of the other, in a personal quest that can help the walker in answering questions, slowing down, going deeper on a spiritual journey, finding healing, and getting unstuck. We invite you to walk MHCC’s labyrinth, which is open to the public every second Wednesday evening (except June) from 7:30-9:00 P.M., and by appointment. We welcome groups to attend the labyrinth during these public walks (women’s groups, yoga classes, church and youth groups, and secular groups). Labyrinth resources and materials are provided to guide your walking experience. Not able to walk? We also have a wooden ‘laptop’ labyrinth to trace the labyrinth with your finger. On Good Friday, we offer a ‘Stations of the Cross’ labyrinth, as seen below. This labyrinth experience is meant to integrate a sensory and symbolic experience of the Passion of Christ. On Good Friday the Labyrinth is open from 12 noon to 6:00 P.M.
Our labyrinth at MHCC is a thirty-five-foot, eleven-circuit labyrinth following the 13th-century labyrinth design, pictured here, of the oldest surviving medieval Christian labyrinth, at Chartres Cathedral in France. Christians have used the labyrinth for centuries, and historically the labyrinth served as a substitute for a pilgrimage to Jerusalem. It could be walked as a pilgrimage for prayer, repentance and meditation. It is still a powerful tool for Christian pilgrims to experience a “prayer journey” to renew their faith, reflect and meditate, and become closer to God.